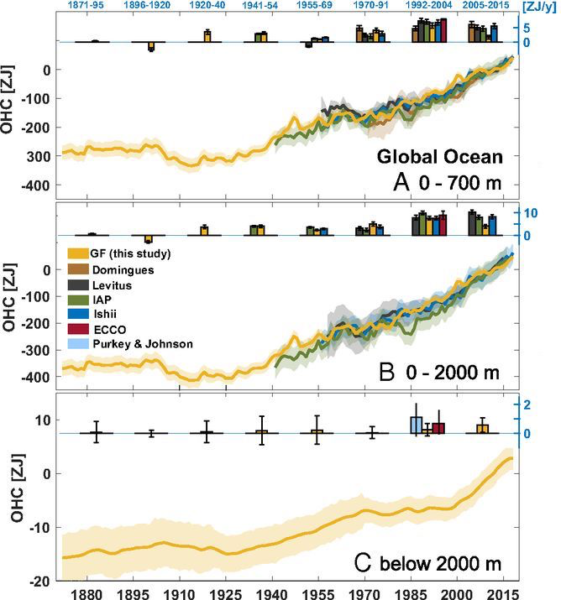 The two methodologies are distinct: ZKGIH19 uses a Green’s function approach to derive the imprint on the deep ocean of changes in surface fluxes from the ECCO project (a reanalysis model that uses modern ocean data to reconstruct a state estimate of the ocean circulation). This is then combined with the history of observed SST (HadISST2) to infer the deep ocean changes. Given the average transit time for the deep Pacific (1000’s of years), it is expected that the deep Pacific won’t be in equilibrium with surface climate changes over shorter time scales. GH19 are not the first to quantify this deep dis-equilibrium (previous work had looked at the เว็บพนันบอล ดีที่สุด 2019lingering impact of Tambora in 1815 for instance), but this might be the estimate most consistent with the (sparse) early observations. The caveats are (as usual) there are still imperfections in the ocean models being used and the systematic biases in old observations are always being looked at. The differences between the two studies are thus understandable from their study design. On an individual basis, the scientists can sometimes be proud if their forecast has been useful for better managing the consequences of an event, or be upset that it wasn’t, but the quality and relevance of their expertise does not depend on their state of mind. But the principal role for climate scientists is to inform the public debate about the outcome of collective science efforts and the risks associated with the different trajectories of greenhouse gas emissions, not how they feel about it. As the last IPCC special report on 1.5°C reminded us, the real issue is that we currently face three types of major risk. The first risk is related to each additional fraction of warming, with humanitarian, agricultural, environmental and migratory crises, increasingly challenging to manage. The second risk is the burden passed on to today’s younger generations, who would face the triple trouble of coping with the impacts of global warming; having to accelerate abruptly the transitions to a low-carbon economy if we delay in putting it in place; and lastly, to have to choose options that are potentially very risky for both biodiversity (for example through massive use of biomass energy) or global governance (for example, geo-engineering) in an attempt to contain global warming or its consequences. The third risk is rapid transition to the economy and the current global financial system through the ‘stranded assets’ of capital invested in the fossil fuel industry. What if the focus on the moods of climate scientists was a way to disengage emotionally from the choices of risk or solutions to global warming? Since the experts are worrying about it for us (it’s their daily life, isn’t it? ), let’s continue our lives in peace. If feelings and expressing emotions – fear, anger, anguish, feelings of helplessness, guilt, depression – in the face of risks are legitimate, even necessary, to take action demands that we go beyond that. Catastrophism often leads to denial, a well-known psychic mechanism for protecting oneself from anxiety. Managing risk is part of our daily lives and supposes that we are not in such denial (active or passive) as it prevents clear and responsible action. Because we know that many hazards carry predictable risks, human societies have learned to anticipate and cope, for example, to limit the damage of storms or epidemics. The challenge of climate change is to build a strategy not in response to an acute and clearly identified risk, but in anticipation of a gradual, chronic increase in climate risks. For instance, there are some great web-portals, such as NASA/GISS, Global Historical Climate Network (GHCN), and the KNMI ClimateExporer. These portals are extremely useful for scientists and experts (they also give the contrarians numbers on which to build their misconceived ideas), but they may be too complicated for a lot of people. 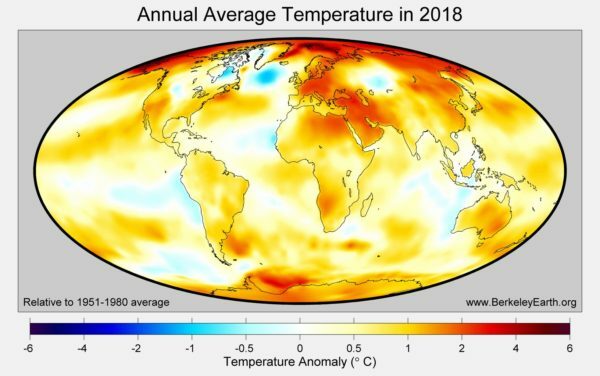 In contrast to this caution, SR1.5 portrays all the global warming observed since the late 19th century as being human-induced (see Figure 1). This major departure from the Fifth Assessment is presented without any rigorous justification. This is categorically, absolutely, and totally, untrue. The starting point for SR15 is actually exactly what was in AR5 together with more recent literature. Now, this is not the first time that someone has apparently “misunderstood” these lines. I had a substantial back and forth about them with Judith Curry a few years back (see here, and เว็บพนันบอล ดีที่สุด 2019here). [Unsurprisingly perhaps, she thinks Bates’ report is an “excellent analysis“]. The agreement shown in the figure between the observations (with interannual variations smoothed out) and the mean of the climate simulations (produced by global climate models; GCMs) is close, suggesting that strong confidence can be placed in both the indicated acceleration of the warming and its modelled anthropogenic origin. … except that, this isn’t what is shown in Fig SPM1 at all. 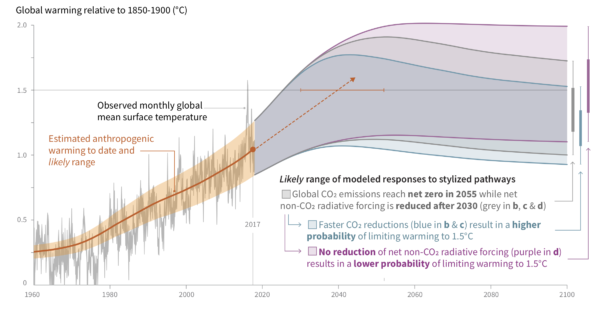 Instead, alongside the observations is an estimate of the attributable warming to anthropogenic effects from Haustein et al. (2017), which is not the ‘mean of GCM simulations’ in any respect. Fig SPM1 from the IPCC SR15. No CMIP5 model data at all. It gets even better. 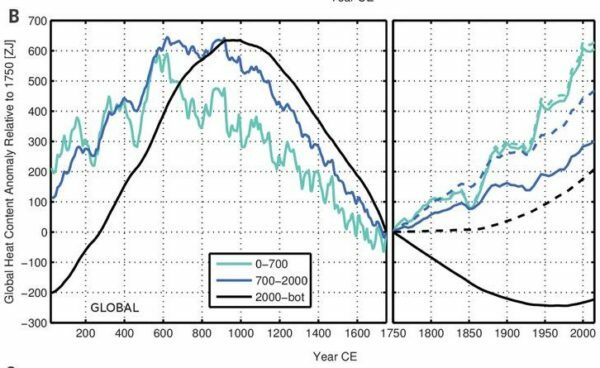 Later in Bates’ article, he is quite enamored by the climate sensitivity results of Lewis and Curry (2018) but doesn’t seem to realise that their results assume that all of the trends since the 19th Century are forced. The exact conclusion he rails against in the first section! The other paper he likes for it’s climate sensitivity work is his own somewhat obscure effort (Bates, 2016), which argues for an ECS near 1K, despite the clear evidence that the planet has already warmed up by that, with a net forcing substantially less than 2xCO2, and with an ongoing energy imbalance (as evidenced by observed increases in Ocean Heat Content). This, to be gentle, is pretty much impossible. 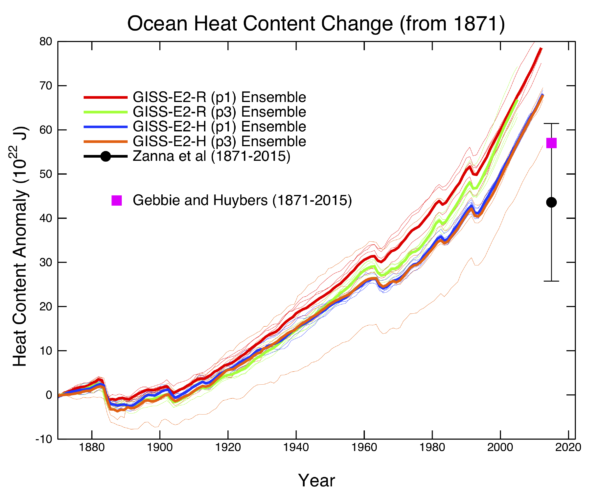 Ocean heat content changes in 10 year simulations of the new CERA system over different depths. The drifts in the early decades are an artifact of the coupled model system. 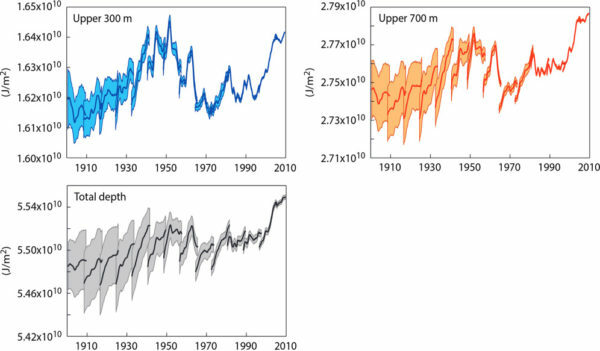 He uses this to claim that “the natural variability of the global SST is greater than had previously been estimated”, when a) this doesn’t show SST (though it is related), b) much of the variance pre-1980 is unphysical model drift, and c) the increases in the full depth OHC actually match direct observational estimated (which is unsurprising since this is a data assimilation exercise). The rest of the report goes from the sublime (just kidding) to the ridiculous (e.g. using a paper by Nicola Scafetta as an authoritative (!) source – anyone heard of autocorrelation or over-fitting?) and cherry picking the few datasets that minimise current changes. He cut-and-pastes a figure from John Christy that we have oft criticised before. He misreads the climate model tuning paper by Hourdin et al (2017) to claim that all CMIP5 models tuned their results to match the 20th Century trends [Narrator: they did not]. But even if it actually were true, it still wouldn’t impact the results in the first figure he attacks because that doesn’t show the CMIP5 models at all. He appears to be unaware of this. Overall, this is basically a dialed-in work-for-hire. It’s incoherent, inconsistent, a little bit funny and adds nothing to our understanding of the science behind the SR15 report, or indeed any aspect of the attribution issue. Update Jan 2019: The original report from Bates (here) has now been replaced with one that tries to fix the more egregious errors, er… I mean that makes “clarifications that arose in the context of discussions with colleagues”. Lol.